I am totally making this one up, but I kind of love it and think it would be as understandable as the English neologism. 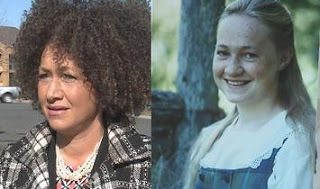 If you've read any US news in the last few days you've heard of Rachel Dolezal's blackface. There is such a long history of people doing similar redface charades (a la Grey Owl) that there is this term for them. Actually Rachel also claims to be native and, get this, to have been born in a tipi. Because I guess being pretend black wasn't enough? I learned the word pretendian from the great blog post, Rachel Dolezal, Blackface, and Pretendians, by Ruth Hopkins, which is well worth reading. Anyone know of stories of fingindios in Latin America?